Handy addition to make it easier to plug into my motorcycle without having the hassle of a hard wired connection. Makes charging my Freelander a doddle. Good piece of equipment. very pleased. Great addition to the MXS 7 charger. Simply plug into your cigarette lighter socket and charge away. No fiddling about with battery terminals under the bonnet in the rain. Does what it is meant to without problem. Ideal for trickle charging before your trip. Well made and easy to use, if your cigarette charger is always live then an essential accessory to use with the CTEK charger. Makes using the CTEK even easier, takes moments just to stick your vehicle on charge. Great for just popping your vehicle on a quick peace-of-mind charge - you don't even need to get the spanners out. 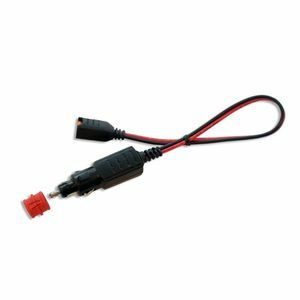 The CTEK cigarette lighter lead allows me to charge my vehicle battery securely and reliably when parked, using an external caravan-type mains connection. The CTEK charger is kept in the vehicle at all times ready to be plugged in when I park. The charger lead arrived in the same carton as the charger, ordered at the same time, on the second working day as expected.